A company producing Ti 6 Al-4V components using additive manufacturing came to Lucideon for assistance with AM powder handling problems that arose after changing powder suppliers. Varied flow behavior associated with powder recycling. 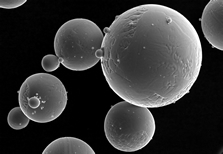 Make recommendations regarding metal powder conditioning for use in AM. Through our detailed analysis our client could introduce procedures to condition their powders for more consistency within their process. Through the data provided on structure, PSD and morphology they could alter their process to suit the new supply of powder and avoid the issues they were experiencing. The client was also introduced to Factorial Experimental Design (FED) expertise available at Lucideon. FED can deliver further optimization of the AM process by considering the joint impact of raw material and process variables on the quality of intermediate / final items.